Sainted Polycarp, Bishop of Smyrna, was born about the year 80 and lived in Asia Minor in the city of Smyrna. He was left an orphan at an early age, but through the direction of an Angel, he was raised by the pious widow Kallista. After the death of his adoptive mother, Polycarp gave away his possessions and began to lead a chaste life, caring for the sick and the infirm. He was very fond of and close to the holy bishop of Smyrna Bukolos (Comm. 6 February). He ordained Polycarp as deacon, entrusting to him to preach the Word of God in church. At this time the holy Apostle John the Theologian was still alive. Saint Polycarp was especially close to Saint John the Theologian, whom he accompanied on his apostolic wanderings. Sainted Bukolos ordained Saint Polycarp presbyter, and shortly before his death expressed last wishes that he be made bishop upon the Smyrna cathedra. When the ordination of Saint Polycarp to bishop was accomplished, the Lord Jesus Christ appeared to him. Saint Polycarp guided his flock with apostolic zeal. He was also greatly loved among the clergy. With great warmth did Saint Ignatios the God-Bearer regard him. Setting out to Rome where execution awaited him (he was torn asunder by wild beasts), he wrote to Saint Polycarp: "Just as the winds and turbulence require the rudder – for coming ashore, so likewise are the present times necessary, in order to reach God". The emperor Marcus Aurelius (161-180) came upon the Roman throne and started up a most fierce persecution against christians. The pagans demanded that the judge seek out Saint Polycarp – "the father of all the christians" and "the seducer of all Asia". During this while Saint Polycarp, at the persistent urging of his flock, stayed at a small village not far from Smyrna. When the soldiers came for him, he went out to them and led them in to eat, and at this time he began to pray, having prepared himself for the deed of martyrdom. His suffering and death are recorded in "An Epistle of the Christians of the Church of Smyrna to the other Churches" – one of the most ancient memorials of Christian literature. Having been brought to trial, Saint Polycarp firmly confessed his faith in Christ and was condemned to burning. The executioners wanted to tie him to a post, but he calmly told them that the bon-fire would not work, and they could merely tie him with ropes. The flames encircled the saint but did not touch him, coming all together over his head. Seeing that the fire did him no harm, the throng of pagans demanded that he be killed with a sword. When they inflicted the wound upon Saint Polycarp, there flowed from it so much blood, that it extinguished the flames. The body of the priestmartyr Polycarp was then committed to flame. The Christians of Smyrna reverently gathered up his venerable remains, honouring his memory as sacred. 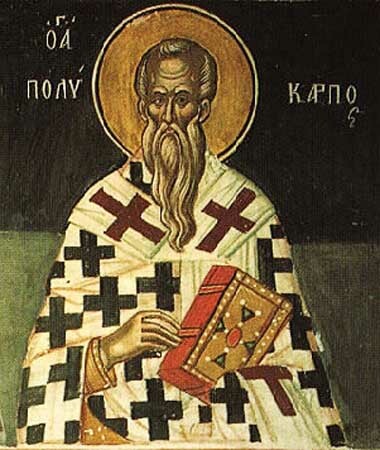 A story has been preserved about Saint Polycarp by his disciple, Sainted Ireneios of Lyons, which Eusebios cites in his "Ecclesiastical History" (V, 20): "I was still very young when I saw thee in Asia Minor at Polycarp's, – writes Saint Ireneios to his friend Florinus, – ...but I would still be able to point out the place where Blessed Polycarp sat and conversed, – be able to depict his walk, his mannerisms in life, his outward appearance, his speaking to people, his companionable wandering with John, and how he himself related, together with other eye-witnesses of the Lord, – those things that he remembered from the words of others and in turn told what he heard from them about the Lord, His teachings and miracles ... Through the mercy of God to me, I then already listened attentively to Polycarp and wrote down his words not on tablets, but in the depths of my heart ... Wherefore, I am able to witness before God, that if this blessed and apostolic elder heard something similar to thy fallacy, he would immediately stop up his ears and express his indignation with his usual phrase: 'Good God! That Thou hast permitted me to be alive at such a time!' ". During his life the sainted bishop wrote several Epistles to the flock and letters to various individuals. There has survived to the present his Epistle to the Philippians which, on the testimony of Blessed Jerome, was read in the churches of Asia Minor at Divine-services. It was written by the saint in response to the request of the Philippians to send them a letter of the PriestMartyr Ignatios, which had been preserved by Saint Polycarp.